What next for Meercat Boats? David Rutter is Meercat Boats’ Business Development Manager. His background spans autonomous vessels, design and sale, through to military operations. He has worked with the team at Meercat Boats for two years and has seen the business and sector significantly evolve over that period. Here he answers a few frequently asked questions and sheds light on the future of British shipbuilding and the commercial marine sector. Meercat Boats are versatile multirole steel workboats, built 100% in Great Britain. Over 34 vessels have been built by the Meercat team over the last 10 years. The company originated with building road transportable multirole workboats, which were and are still used across all aspects of port servicing, ship servicing, aquaculture, dive support and dredging. The versatility of the modern workboat has increased in recent years, what with new equipment and more thought-out design, the workboats are more than capable of mixing it with vessels normally designed for a specific purpose such as dredging, load carrying, towing / pushing, even down to recovering vessels that have been damaged or sunk as seen in the latest isle of Wight ferry collision video. How are commercial marine sub-sectors evolving? Aquaculture has developed a lot in the recent years and with nets getting larger, equipment changing and more equipment being used, workboats have played a major role in helping the industry take that step forward, whilst there are specific vessels, such as feeder barges, well-boats and similar. The multirole workboats will always be an important part of the aquaculture sector’s operations due to their versatility, longevity and strength; Meercat Boats has just completed its seventh vessel within the aquaculture industry. In addition, there is still a strong demand for vessels operating within port harbour servicing, often linked to other aspects of commercial marine operations such as wind farm service support or ship bunkering. Meercat Boats recognises the increasing versatility of the workboat and this is reflected in the current designs. Bollard pull has increased, deck load strength has gone up considerably, including larger cranes, purpose-built accommodation and more emphasis on crew comfort. The boats are already regarded as strong and long-lasting at very competitive prices, however in response to the market and existing clients’ requirements, the vessels will now also encompass even greater deck strength and bollard pulls being able to go up even further than before. Whilst Meercat Boats still build road transportables, we have experienced an increase in requests and demand for larger vessels such as the latest 20-metre M20 and the proposed M24 steel monohulls. The advantage of buying a Meercat vessel is they tend to be built for a client’s specific request and the choice of layout is entirely down to them. Meercat Boats not only offer vessels within their broad workboat range but also bespoke builds, landing craft and as shown just recently, a purpose-built oil spill response vessel for a client in Europe. Meercat Boats’ design team offers a wide variety of layouts for the wheelhouse and deck equipment. 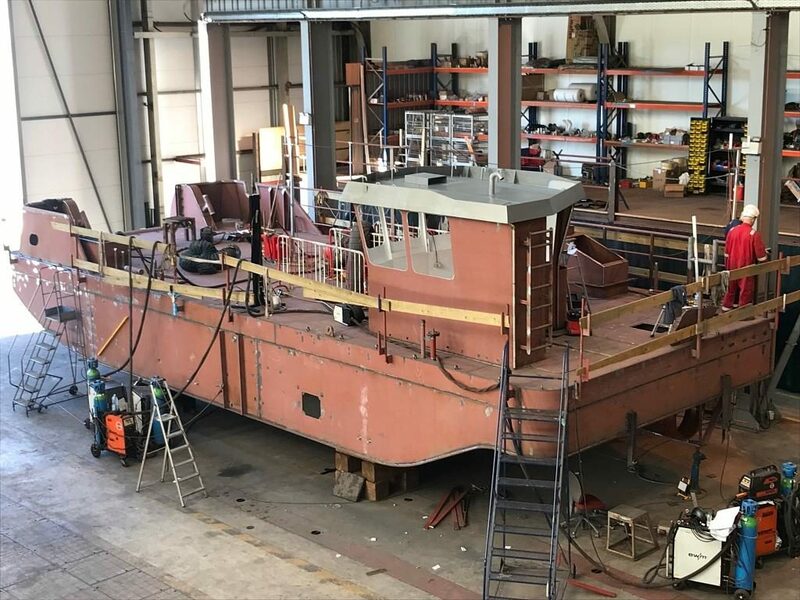 Meercat Boats are known for building extremely good quality and robust vessels delivered in a very reasonable timeframe, such as 16 weeks for an M15 15m workboat; which results in the client having the precise boat for the operations required. What is the process to buy a Meercat Boat? The buying process starts with clarification of the client requirements in detail. Next the Meercat Team including its in house designers or if requested, external naval architect designers, will generate a GA (General Arrangement Plan). Often a client will visit Meercat’s Southampton yard to see the current vessels in build. The GA will be tweaked until it is absolutely matching the client’s requirements before getting the green light and commencing the build. It has even been known for a client to make some changes during the build. This process can be as quick as a few weeks if the client knows precisely what they require. Meercat Boats works with financial partners, therefore can assist in financing a vessel on a loan or mortgage basis. The advantage to buying a vessel that has already been built does have its merits. Quite often a client requires a vessel quite quickly in order to service a project they are bidding for, which works well for a buyer as quite often they will not make the purchase unless they have won the project. However, options for customising a pre-built vessel is often limited, which means that the vessel will not precisely match the client’s requirements. Meercat Boats have the solution for those businesses who require a vessel immediately, however would like to have a bespoke build. We can offer the client a vessel to lease on a reduced rate basis while their vessel is in build. We can offer the client a vessel to lease on a reduced rate basis while their vessel is in build. Not only does this assist the client with a readily available workboat but it also ensures they then take ownership of a purpose-built vessel which will last them a very long time. Part exchange of a client’s existing vessel is also an option, which further expedites a speedy purchase. Coincidentally, Meercat Boats also hold their value extremely well, which makes it attractive for financiers and buyers alike. How has Brexit changed your business? There has been a noticeable increase in enquiries for vessels from international clients in recent times. Whether this is down to the exchange rates, Brexit or more people wishing to buy British products is yet to be determined, however all will most likely be contributing factor. From a Meercat perspective this is a very good thing, there is always encouragement from the Department for International Trade to increase exports and it appears to be just that little bit cheaper nowadays in delivery costs. As strong repeat business and ongoing industry demand demonstrates, the long-term future is bright for Meercat Boats.